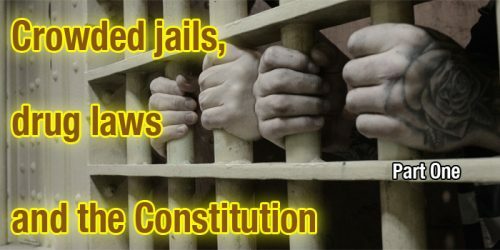 The following is the first part of a three-part series on jail capacity, crime and punishment and personal liberty. WARSAW — Newly-elected Kosciusko County Sheriff Kyle Dukes wasted little time, following the coming of the new year, pulling his personal brand out of the fire and stamping his unique trademark on the job of Kosciusko County’s top cop. Among innovations such as re-branding his domain as the Kosciusko County Sheriff’s Office and giving the county jail a thorough cleaning, he also opted to tackle the ever-present issue of jail overcrowding and addressed initial success at the most recent meeting of the county council. But while Dukes, with help from his jail commander, former Marine Shane Coney, uses out-of-the-box thinking and good old-fashioned horse sense to scale back the jail census to its official capacity of 294 inmates, many seemingly-related issues have some citizens wondering if there couldn’t be more done to ease the number of people behind bars. Among possible solutions are building more jails, re-thinking drug laws, or at least how violations are adjudicated and coming up with alternatives for sentences which will allow offenders to serve their time outside of a jail cell. For others, recent trends that they say have eroded personal morality have also contributed to more people wearing jail jumpsuits. More Jails Or More Sermons? Social media sites such as Facebook, are loaded with memes and personal comments from highly-opinionated individuals who address the problems of the day. These modern-day prophets say many of today’s most prominent negative issues — and jail over-crowding is included in the discussion — can be attributed to a thinning in the moral fiber that existed decades ago when church attendance was higher and public shootings in schools, public venues and places of worship were rarely, if ever, heard of. Duff added that while the idea of harkening back to a time when future violent offenders had much fewer stimuli acting as a desensitizing agent to their moral compass might be a great hope, he is not optimistic. According to Dukes, his facility is land-locked and most likely cannot be expanded. Instead, officials at the prosecution end of the issue get creative and find ways for offenders to serve their sentences while still leaving one of the county jail’s beds unoccupied or available for more appropriate tenants. In the second part of the series, Dukes will discuss programs designed to provide alternatives to serving a sentence in a jail cell.